At one point in Jesus’ ministry people, presumably parents and grandparents, were bringing small children to Jesus. His disciples responded by rebuking them, essentially trying to get them to go away and leave Jesus alone. This was Jesus, after all, the one who taught and healed so many; surely he had important things, adult matters, that he must attend to! Jesus’ reply was to rebuke the rebukers. Children are important, he assured them while he took the little ones into his arms. Oh, and by the way, God’s kingdom is for the children and if you don’t receive it like a child then you won’t have a place in it. Strong words for these men who followed him. So, what is it that sets children apart? What is it that we must imitate? In some ways we are to be decidedly not child-like. Upon coming to Jesus, being reborn as spiritual infants, we are to feed and be fed on God’s word and grow into mature spiritual adulthood (Hebrews 5:11-6:3, 1 Peter 2:2-3). But in another sense, we should always remain very child-like in faith. What sets children apart from adults is how freely they trust. Sadly, in a sin-stained world, such trust can be abused to the child’s harm; but this is not so with God. God is perfect in love as the great Father. He may discipline us for our good, but he never abuses and causes harm. Our trust in God is to be childlike, unhindered and free. We’re to see him as the Good Father who always does what is best for his children. We’re to see him as the Great Provider who gives us what we need and beyond what we need for eternal joy. We’re to see him as the Solid Rock to whom we anchor our lives and future hope. We’re to come to him to be received by him and be blessed by him, without hindrance or hesitation, because that is the very thing he calls us to through Jesus. We’re to have the trust of a child because, if we belong to Jesus by faith, then we are God’s children, and we can rest secure and happy in his arms. Image taken and modified with permission from pixabay.com. Reading the Bible is like stepping into God’s house. Everything is there because He desires for it to be there. If it is in the Word of God, which lasts forever, then it must be important to Him. As I read Leviticus, I am confronted with the reality that there is a whole book dedicated to different types of sin and their corresponding offerings. If it was important to God for this to be in His Word, I must conclude that our sin really, really, really bothers Him and that all sin, no matter how small, must be paid for. 13. Pray over your children. Do you consider the church in the decisions of your life? Do you ask yourself how your job change could affect your church? Do you consider how your moving would impact the work of God through your church in your community? Do you seek insight into how your decision to leave or stay at your local church would affect the advancement of the gospel? Children’s Christmas Program, Wednesday 12/21 @7pm (if you have children in the program, please have them to the auditorium by 6pm for costumes and a final dress rehearsal). This date is the rescheduled date due to weather conditions. Christmas Eve Service, Saturday 12/24 @6:30pm. Join us for our annual candle-light service, with snacks and hot chocolate to follow. Christmas Day Service, Sunday 12/25 @10:45am. We will gather at our normal time on Christmas morning to celebrate Jesus. Sunday School will also be at 9:45am for those able to make it. There will be no evening church activities on 12/25, 12/28, or 1/1. 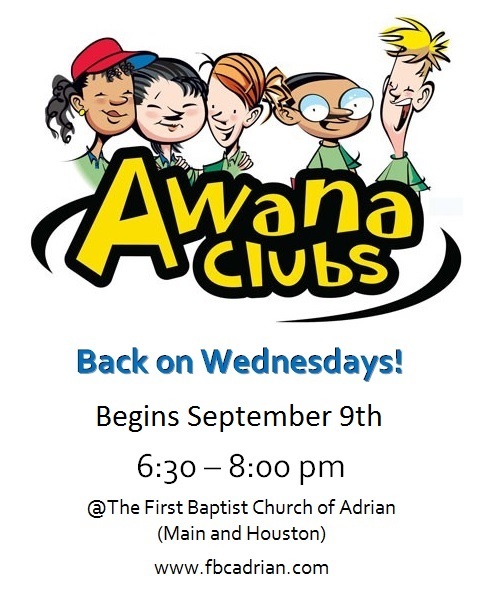 Awana begins in 1 week! Are you ready? 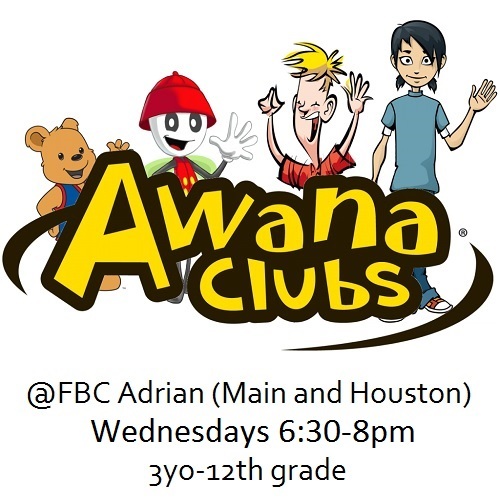 Check out our Activities page for more information, a link to our Awana Facebook page, and a registration form you can download and bring with you.